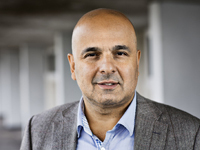 During the opening session of the International Headache Conference, Dr Messoud Ashina, working in Copenhagen, was asked to present the future of migraine research. Here are some research ideas he discussed and presented as important topics of interest for researchers. Migraine with or without aura : are they really different? About 20% of migraineurs have auras, most with visual symptoms. Auras are caused by an electrical wave spreading on the surface of the brain. Is it possible that even migraines without aura are triggered by such a wave, that would spread on zones of the brain without producing any symptoms? Migraine and inflammation : which substances are the main culprits? The migraine attack involves an inflammatory component. When triggered by many different things, the brain causes the release of irritant substances in the vicinity of meninges and cerebral arteries, causing the migraine pain. The principal substance under scrutiny now is CGRP, but two other irritants are getting more attention, PACAP and VIP. New culprits could lead to new drugs! Is the brain protective barrier secure in migraineurs? The brain is protected by a special isolating system or filter (the blood-brain barrier or BBB) that prevents certain drug to enter. This filter can be broken by inflammation. What happens to the BBB during a migraine attack? Is it open or closed? This has important repercussions on drug development. Why does the migraine attack stop? Even without any treatment, or sometimes with sleep, most migraine attacks do stop. If we understand better the natural brain mechanisms that end a migraine, researchers could be inspired to find new treatments. So here are subjects to tackle for migraine scientists. More from the congress soon!